Legend has it, the Cofficionado created a smooth barista-style coffee by grinding each whole bean with his bare hands, and can whip up a frothy, creamy Latte with just a splash of water. 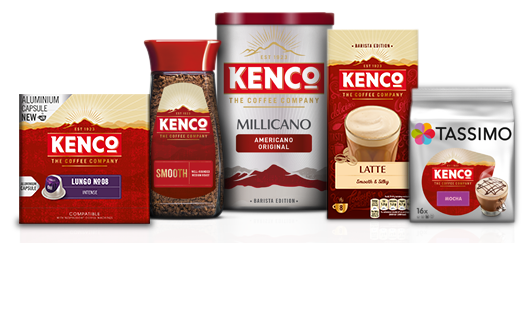 Explore below and discover the rest of the Kenco range. Our coffee beans are finely milled for a bold, rounded taste and rich aroma, expertly blended for you to create a coffee-shop style Americano, at home. Encounter the deep and complex aroma of Kenco Millicano Americano Intense, for a full-bodied coffee experience, in an instant. Kenco Millicano Decaff provides the rich and inviting aroma of Kenco Millicano, for a barista-style blend that can be enjoyed morning, noon and night. The all-time favourite. Kenco Smooth’s full-flavoured aroma and superior smoothness are what makes it the perfect choice. Pick up the perfect summer accessory! The velvety taste of a classic coffee with an ice-cold twist. Exclusive to Tesco. Indulge this summer! Try our perfectly smooth and deliciously sweet vanilla iced latte. Exclusive to Tesco. This summer’s must-have! A refreshing iced coffee with the perfect mix of sweet and salty caramel. Exclusive to Tesco. The taste of summer! Try our refreshing coconut iced latte. Smooth coffee with a tropical twist. Exclusive to Tesco. Take time to enjoy a Kenco Latte.With a touch of sweetness and irresistible milkiness, it’s all the indulgence of your coffee-shop favourite, in an instant. Our new Mocha is the perfect blend of smooth, rich coffee and deliciously indulgent chocolate, bringing you coffee-shop luxury… in an instant! Meet our first instant Flat White! It’s the perfect balance of strong espresso and smooth milk, for a bold and velvety barista style coffee. Just add water! A delicious big bean blend balanced with yummy caramel flavour, the perfect treat to recharge your senses. The perfect balance of big bean coffee and silky Irish Cream flavour. Top with whipped cream for all the pleasure, without the alcohol. Big bean coffee taste combined with nutty hazelnut flavour. Savour with a sweet amaretto biscuit on the side. The finest characteristics high-quality Arabica and Robusta beans, enhanced by a deep-roasting process for an intense, bold taste. Our Espresso No. 10 combines the spicy sweetness of Robusta beans with the fruity characteristics of Arabica beans. A powerful Espresso with a rich aftertaste. Take a sip and experience the intense richness of this full-bodied blend – carefully roasted to create an irresistible flavour and distinctive aroma. Our delicious decaff is made with the finest quality beans, expertly roasted for a balanced, pleasurable experience. We’ve expertly blended and roasted the best quality beans for a full flavour and delightful aroma, capturing that a delicious coffee shop taste, in an instant. Made with 100% single origin Colombian beans, this balanced medium roast brings subtle floral aromas and a fruity top note for a taste of simple perfection. This dark, feisty coffee is made with 100% single origin beans, unique to the rich volcanic soil of Costa Rica, for an intensely aromatic trip to the dark side. Fall in love with Kenco Cappuccino – an expertly crafted barista style coffee with the rich, smooth taste of Kenco and a distinctive, deliciously creamy froth. Experience the creamy froth of a coffee-shop cappuccino, combined with the smooth flavour of Kenco coffee - with a bold, unsweetened taste. Just add water! Brew the ultimate aromatic coffee every time, with the deliciously well-balanced Kenco Tassimo Americano Smooth - an authentic coffee shop experience, at home. Experience the subtle citrus flavours of Colombia’s finest Arabica beans with Kenco Tassimo Colombian, brewed to perfection in your Tassimo machine. Recreate the wonderfully rich, distinctly roasted flavour of a coffee-shop Americano, expertly brewed every time with Kenco Tassimo Americano Grande. Just a sachet of Kenco 2in1 is all you need for an uplifting and delicious white cup of coffee in seconds – wherever and whenever you fancy! With Kenco 3in1 you can enjoy your favourite cup anywhere, anytime. Balanced to be flavourful and satisfying - white coffee with a dash of sugar. Kenco’s aluminium capsule is specially designed to be used with Nespresso®* Original coffee machines, with the exception of U®*, Umilk®*, Expert®*, Expert&Milk®*, Prodigio®* and Prodigio&Milk®* models bought after 25 July 2016.